Please take a moment to watch GreenScreenCinema's latest release: "Gingerlicious". While "Gingerlicious" is the story of two gingerbread cookies in search of a new home, it's also a demonstration of the three most powerful matte effects found in Adobe After Effects CS5: color key, color range and rotobrush. Color key - After Effect's color key is a pretty straightforward greenscreen tool. When the user chooses a key color that color is then removed from the scene. Hopefully this only removes your background from the scene (leaving your subject intact). Color range - The color range effect attempts to give the user a few more knobs to twist. Color range allows the user to pick multiple colors that need to be removed from the scene. Color range is often used when shadows and background color variation make a single color key ineffective. Color range is essentially the poor cousin of Premiere's Pro Ultra key effect (which I am madly in love with). 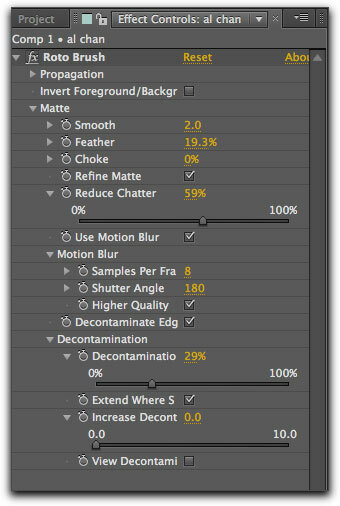 Why Adobe didn't ship After Effects with the Ultra effect is beyond me. Rotobrush - The rotobrush tool gives filmmakers a way to lift an image out of the visual plane as if by magic. Hours and hours of tedious, time consuming magic, that is. With rotobrush you have to brush an outline over the area you want to keep. The effect tries to follow the object you've outlined as it moves across the frame, but the effect appears to be under the influence of some mind altering substance. It will randomly decide that your subject's arm should no longer be connected to his body, for example. You can almost hear the effect's drug-induced giggle as it makes these crazy decisions. You can correct these mistakes, but after you've repaired the damage you'll have to listen to the effect call you a "big downer" and threaten to never drive you to Burning Man ever again. I made up the part about Burning Man, but everything else I said is absolutely true. 1) The entire set of frames will be recalculated. You will slowly lose your mind as you watch your hours of work get undone by any changes made to the early frames (e.g. any small tweaks to the initial selection area will propagate throughout the entire clip, resetting the selection area in all subsequent frames, wiping out any tweaks you might have made to those frames). 2) The controls that allow you to tweak the effect will be disabled. You will no longer be able to "invert foreground/background" for example. This will also cause you to lose your mind when you realize how much time you just wasted preparing the effect when you still need to smooth the edges. You can "unfreeze" the frames to gain access to the controls once more, but you will inevitably need to "freeze" the frames again in order to complete the shot. As a result the statistical chance of losing your mind goes up each time you try to improve the rotobrush result. If you take a close look at the final "Gingerlicious" shot with the dog and the gingerbread cookie you'll see the sloppy matte that comes from simply wanting to keep your sanity. In the end there's really no comparison between keying and rotobrush effects. The keying effects in "Gingerlicious" (the first dog shot and all the other gingerbread shots) took just a few seconds to set up. The rotobrush effects (the final two dog shots) took about 8 hours each. Once Adobe gets rotobrush weaned from whatever hallucinogenic they raised it on they might have another hit on their hands. But for now it should only be used as a last resort: a glimmer of hope for those dark moments when all other matte effects fail.